I, Corin an Fol, one time heavy drinker, womaniser and general good for nothing, was born during the night of the Great Storm. 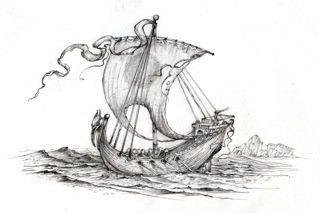 That same infamous blow responsible for wrecking the High King’s flagship off the rocky southern coast of Fol, and claiming the lives of his spouse, the High Queen, her adolescent son, and her younger sister, together with her own baby boy. My village, Finnehalle, was battered and several people died. That was what they told me, back then. But of late I’ve had reason to doubt. My childhood was uneventful. Wilder than my brothers, I proved in the main an unremarkable and mostly content boy. That changed during my sixteenth year when the raiders arrived at the village. Crenise cuttroats, they killed my father, my brothers and dragged my mother and sisters off to their vessels bound for slavery beyond. They didn’t get far, a rogue wave claimed raider and victim. It didn’t matter, they were lost to me. I alone escaped death that murderous day, after killing one of the brigands with my father’s rusty sword, and then being knocked unconscious and left for dead. That was when she came. The copper haired beauty who forever haunts my dreams. Vervandi, she called herself back then. It was she who brought me back from the brink, her soothing tones easing the ravaged soul of this headstrong, angry, wild-eyed orphan. I used to believe she was kind, but now I know her real motives. I loved her so, back then. My torn heart lost inside that green/gold mercurial gaze. But it’s foolish loving spirits. She is not of our world and therefore cannot be trusted. Like morning mist fleeing summer water, Vervandi departed when I needed her most. I was left to fret, quarrel and fight, and wreak mayhem throughout Finnehalle and villages beyond. I got a reputation, decent folk avoided me. For a time I found solace with Holly over in The Last Ship – her father’s cosy inn by the water. We’d laugh and share stupid dreams and for a while were happy. But I was too wild, the inkeep (though sympathetic) banned me from his establishment lest he lose all other custom. Reader I make no excuses – I was useless, back then. I had a good friend called Polin. An older man and veteran of the First Permian War. When I knew him Polin was a blacksmith, running a busy forge near the road to Kelthaine. Tough and stern but kind of heart. Polin took me in and put me to honest work. I am strong and capable but we both knew my heart wasn’t in it, so Polin suggested I seek employment as a soldier in the Regiment of Wolves, over in Kella City. The Wolves took in strays and commoners unlike the Tigers and Bears. Those other regiments filled their ranks with second sons from wealthy noble stock. I followed Polin’s advice and served in the Wolves for nine good years, cutting my teeth in the ceaseless bloody border raids known now as the Second Permian War. I became good with sword and knife, canny in ambush and counter attack. I was tough – always have been. My commander the High King’s brother, Lord Halfdan, thought well of me, back then. My swordmaster didn’t. we fell out in a brothel, a girl was involved. He nearly cut my right eye out with his dagger. Nearly. He should have tried harder and finished the job. I’m not big on forgiving. The dagger left its mark from my scalp to my eyebrow. The result being my attitude (never good) got a whole lot worse. I found said swordmaster days later down in Cappel (one of Permio’s several greasy, fly-blown cities.) He was drunk and stupid and I cut him open from groin to chest with Clouter, my yard long blade. I resigned from the regiment that day – what else could I do? I stayed down in Permio contracting out to both sides as hired hand and freebooter. I had no morals, coin was all I cared for, back then. 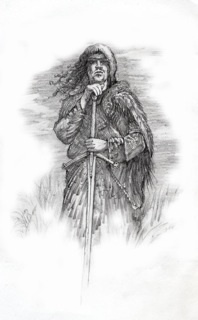 I linked up with a Morwellan hardcase called Hagan, a good fighter and clever with a sword. We fell out a month later. Hagan cheated at dice. We parted company after a fight in a tavern and vowed to murder each other should ever we meet again. On reflection, I did well as a mercenary, there was lots of work and I was paid good silver, and occasionally even gold. It was during a hectic skirmish in a Permian market that the merchant, Silon of Port Sarfe found me. Silon had a lot to offer, being hugely wealthy and in with the right people. He also had a dark-eyed sultry daughter, Nalissa. He needed a loyal thug to keep brigands at bay – hence I got the gig. I worked for Silon for five years, rewarded well in the main, until that unfortunate night when he caught me standing starkers in Nalissa’s bower. Shame that, we’d been all getting along just fine. Accusations followed and I stormed off, returning weeks later to Finnehalle in distant Fol. That was the point when everything changed. The spooks paid visit to Corin an Fol. Riding north I had my first visitation by the Wild Huntsman, the feared horseman in the sky. Then came, Urdei, the laughing girl child up that tree – at the time I’d thought her a vision brought on by evil mushrooms, but she proved real enough. Next up the ghastly crone washing her rags by the river and shrieking that I rode into peril, and bidding me seek my father in the east. Utter nonsense as my father died years ago! Worse still was the visit by the warped dog-thing that night I returned to Finnehalle. But more haunting by far was seeing her face watching me from that broken window at Waysmeet village – Vervandi, returning at last. Those events and what followed are charted in the legends, #TheShatteredCrown and #TheLostPrince at http://legendsofansu.com That’s all from me for the time being, I’ve a kingdom to defend. But watch your back reader, there are bad things out there. I should know, I’m on first name terms with most of them. Mine is a troubled path. I wish you well, Corin an Fol. See you next week! JWW.